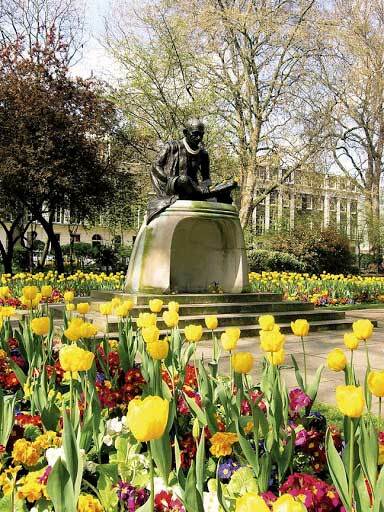 This 14.4 km cycle ride enables you to visit spaces which range from Bloomsbury squares to community gardens via gardens with a strong spiritual dimension. It uses sections of the London Cycle Network as well as the Regent's Canal. 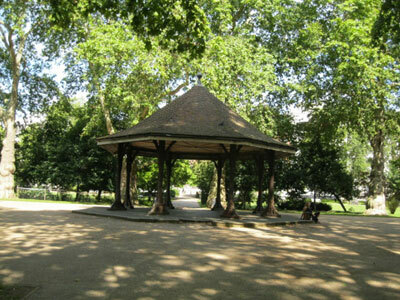 The ride starts and finishes at Russell Square. For a longer ride, it can be combined with the Hackney Ride. This adds between 4.2 and 10.2 km to the distance, depending on the options taken. The ride can conveniently be started also from King's Cross, St Pancras (see Section 7) or Euston station (see Section 9). Directions from these stations are given at appropriate points below. Although you could do the whole ride in a couple of hours, it will more likely take between half a day and whole day, depending on how many gardens you stop at and for how long. For many years, the district traversed by this ride was on the edge of London's built-up area. This meant that it could be used for purposes not possible within the built-up area, such as burial grounds and residential developments with communal gardens. Many of these have now become public open spaces. More recent years have seen the creation of new community-oriented gardens. Before starting the ride, you may wish to visit the SOAS Roof Garden. This is situated above the Brunei Gallery in the west corner of the Square (beyond the cabmen's shelter). Cycle parking outside. If you are visiting this garden on Open Garden Squares Weekend, be careful to check the opening times. 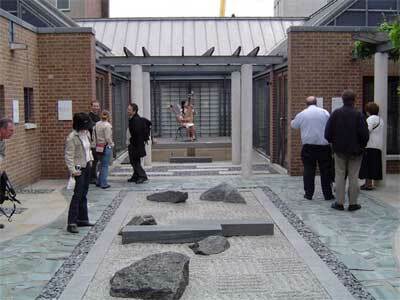 The School of Oriental and African Studies (SOAS) has a modern Japanese-style roof garden designed by Peter Swift and opened in 2001. Its theme is 'forgiveness' and it is a space for quiet contemplation and meditation. The garden is open to the public during the Brunei Gallery opening times. 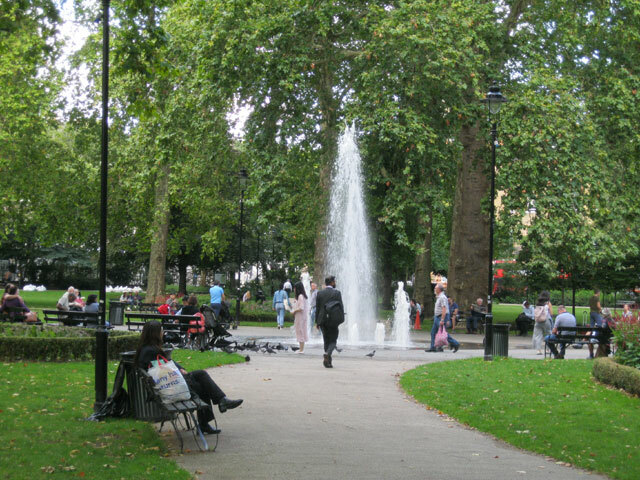 Russell Square was designed as the centrepiece of the fifth Duke of Bedford's 1800 development plan for northern Bloomsbury. The gardens are now a public park and were sympathetically restored in 2001 in a style similar to Humphry Repton's original design. There is a popular café. From SOAS, ride around the NW side of Russell Square and make for Bernard Street which is straight ahead, with a sign for Russell Square Station at the end of it. There is a cycle lane down the middle of the road guiding you there. Take the first right after the station (Grenville Street) and turn left into Guilford Street. After about 150 metres, you come to the gates of Coram's Fields Children's Playground. For a shorter ride, skip to Section 3. Coram's Fields are a seven-acre playground occupying the site of the Foundling Hospital, established by Captain Thomas Coram in the 1740s to provide a home for destitute and abandoned children. Adults are allowed in only if accompanied by children. Turn left into Mecklenburgh Place and follow the road round to the right and then turn left into Mecklenburgh Square. 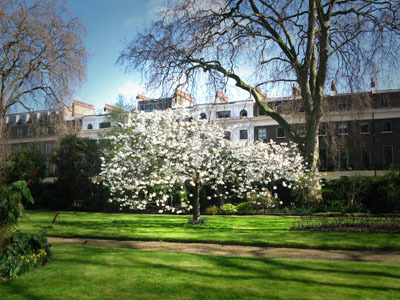 Mecklenburgh Square was developed by the Trustees of the Foundling Hospital in 1810-20. Although not much of the private gardens can be seen from the street, the architecture, restored after bomb damage, is worth seeing. Continue straight ahead and through the gap into Mecklenburgh Street. At the end, turn right into Heathcote Street, which leads to Gray's Inn Road, on the other side of which is the Calthorpe Project Community Garden (cross the road on foot at the traffic lights). 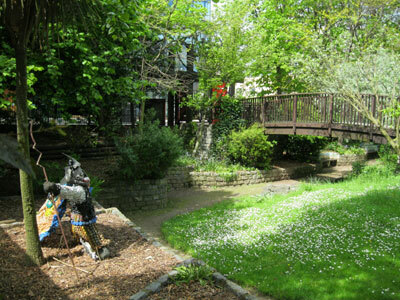 The Calthorpe Project Community Garden is a 1.2 acre community garden. It opened in 1984 after local people campaigned against the land being sold for development. The garden is in the process of becoming an accredited training centre, running courses in basic construction skills and gardening. It is open most of the time except Sundays and Saturday mornings. Cross back on foot to Heathcote Street and ride to the far end, where there is a gate into St George's Gardens. Formerly two burial grounds, St George's Gardens are now a peaceful retreat with imposing ivy-clad tombs and gravestones. The gardens were restored by the London Borough of Camden in 2001. Leaving the gardens through the gate at the far end, go straight ahead into Handel Street (so named because of the composer's support of the Coram Foundation) and turn left into Hunter Street. Turn left at the roundabout into Lansdowne Terrace, passing the gardens of Brunswick Square on the left. Turn left into Guilford Street (you have been here before). and right into Guilford Place, opposite the entrance to Coram's Fields. 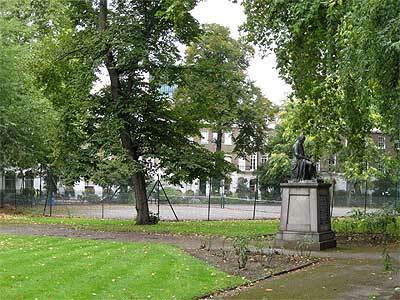 Like Mecklenburgh Square, Brunswick Square was developed by the Trustees of Coram's Hospital. The gardens are now a public park and include fine mature trees. Opposite is the Brunswick Centre, built in 1967-72 and described as "the pioneering example of low-rise, high density housing". Turn right into Guilford Place, opposite the entrance to Coram's Fields. Continue up Lamb's Conduit Street, passing the Lamb pub and the Bikefix cycle shop, both on the left. Cross Theobold's Road (traffic lights) and continue to the end of Red Lion Street. Turn left into High Holborn. If you are visiting Lincoln's Inn, dismount at the first signal-controlled pedestrian crossing, just before Penderel's Oak pub. 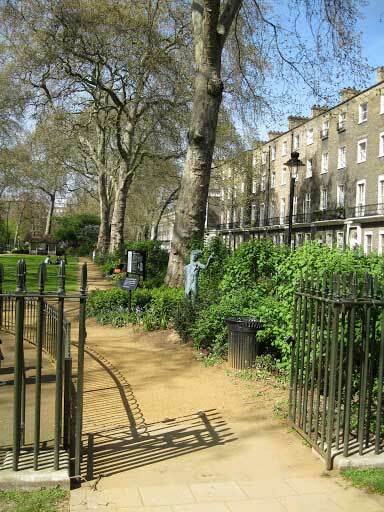 Cross the street and walk through Great Turnstile into Lincoln's Inn Fields. 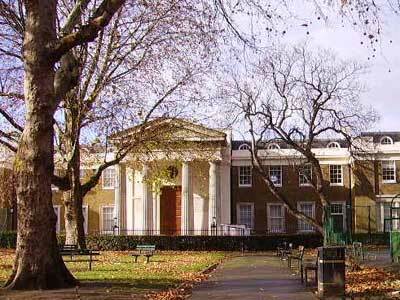 Development of Lincoln's Inn Fields began in 1629. Gardens were laid out in 1735 but did not become a public park until 1894. The layout of the gardens today is largely that of the early 19c. The gate to Lincoln's Inn is on the left. The Inn is usually open during business hours. After visiting Lincoln's Inn, return to High Holborn, turning right out of Great Turnstile. Lincoln's Inn was founded in or before 1422. Its magnificent lawns and trees make up six separate gardens, comprising the North Lawn, Benchers' Lawn, New Square, Gatehouse Court, Kitchen Garden and Stone Buildings. Each garden has been almost completely replanted over the last five years. Follow the bus lane along High Holborn, passing Chancery Lane station and continue as far as Holborn Circus, with a statue of Prince Albert on a horse, raising his hat to the City. Turn half left into Charterhouse Street. Cross Farringdon Road (traffic lights) and continue up the rise, passing Smithfield Market on the right. Continue straight ahead as far as Charterhouse Square. Leave Charterhouse Square through Hayne Street. This was on your right as you entered the Square, opposite the exit gates. Turn left into Long Lane (unmarked) as far the junction with Aldersgate Street (traffic lights). Go straight ahead through the Beech Street tunnel to skip straight to Section 5. This is the only option shown in the printed leaflet. Follow Section 4 to visit the Salters' Garden. 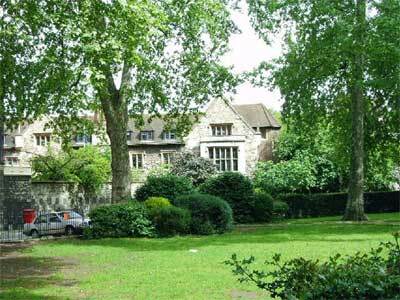 Charterhouse Square was developed as a residential quarter in the 17th century on the site of 14th century plague pits. The pentagonal garden was laid out with diagonal walks, lined with lime trees, bordered on three sides by fine mansions and on the north by rambling old monastic buildings from the 14th century, still visible today. Turn right into Aldersgate Street and turn left at the roundabout under the Museum of London into London Wall. Turn left at the first traffic lights (under a building housing Pizza Express) into Wood Street. Follow the road round to the right into Fore Street, where you come to the Salters' Hall, on the right, with the Salters' Garden at the back of the drive-in. The garden is normally open to the public Monday to Friday 9am-5/5.30pm. 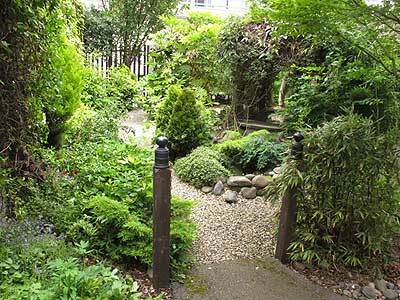 It is open for Open Garden Squares Weekend. It is, however, likely to be closed for works until at least mid-2015. Originally opened in 1981, the Salters' Garden was redesigned as a knot garden by David Hicks FRSA and reopened in 1995 to commemorate the 600th anniversary of the Worshipful Company of Salters. 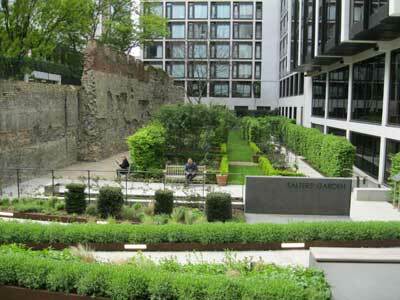 There is a good view of the old London Wall, which forms is southern border. The garden is usually open to the public during business hours. 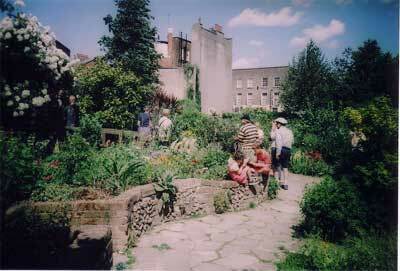 After visiting the Salters' Garden, continue along Fore Street and turn left into Moor Lane. At the end (Chiswell Street) turn left and immediately right into Bunhill Row. If you have come through the Beech Street tunnel, continue into Chiswell Street and turn left into Bunhill Row. After about 150 yards, there is a turning on the left leading to Lamb's Buildings and St Joseph's Church, in a former school, with its garden in front. St Joseph's Garden is a modest tribute to the late Cardinal Basil Hume (1923-99), Archbishop of Westminster, monk and shepherd. The garden was designed by young landscape gardener Simon-Peter Stobart, whose influences included Japanese design and one of the themes from the Song of Songs in the Bible - an enclosed garden in which the Beloved might be encountered and experienced. Photo: © Copyright David Hawgood and licensed for reuse under this Creative Commons Licence. Return to Bunhill Row and continue for a further 150 yards, as far as the entrance to Bunhill Fields. Walk along the path through the burial ground to the City Road at the far end. 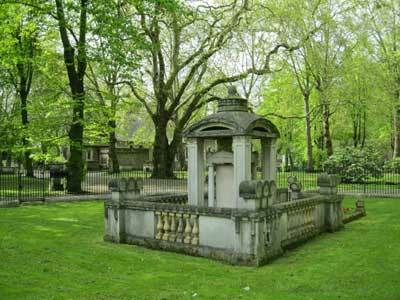 Bunhill is a corruption of 'Bone Hill', and the area was the site of burials for upwards of a thousand years. 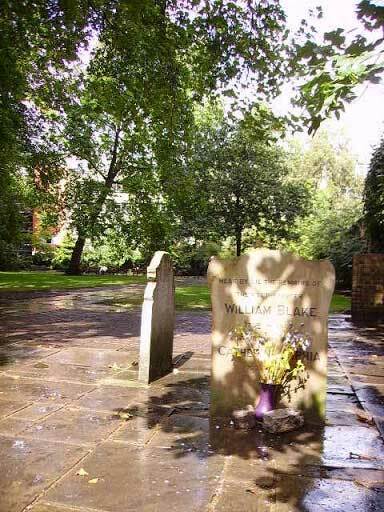 Among those buried here are John Bunyan (1628-88) and Isaac Watts (1674-1742); other memorials include a stone obelisk to Daniel Defoe (1661-1731) of 1870, and a headstone to William Blake (1702-61) and his wife. When you emerge from Bunhill Fields, Wesley's Chapel is facing you to the left, while the ride continues through Epworth Street, facing you to the right, opposite the fortified headquarters of the Honourable Artillery Company. The Mother Church of World Methodism Chapel was opened in April 1778 but rebuilt in 1891. The Chapel Keeper's House, entrance gates and railings are late 18c. Wesley's house, where he lived when in London between 1779 and 1791, is now a museum. The forecourt has notable planes and the Wesley memorial with a bronze statue. Behind the chapel is a small graveyard (visible later from Tabernacle Street) with plain chest tombs and the monument of John Wesley with pyramid and urn. Turn left from Epworth Street into Tabernacle Street, following the signposted cycle route for Shoreditch and Dalston and passing the rear of Wesley's Chapel on the left. At the end of Tabernacle Street, continue straight ahead into Pitfield Street via the cycle crossings of Great Eastern Street and Old Street. As you ride up Pitfield Street, you will pass Aske Garden on the left. Aske Garden is on the site of Aske's Hospital, one of the earliest and grandest almshouses to be built in Shoreditch, which took its name from its benefactor Robert Aske, who also bequeathed money for Haberdasher Aske's School. The buildings were rebuilt in 1825-27 and used as schools and later the Shoreditch Technical Institute. They have now been converted to housing. As you ride further up Pitfield Street, you will see St John the Baptist Church straight ahead beyond a small roundabout. 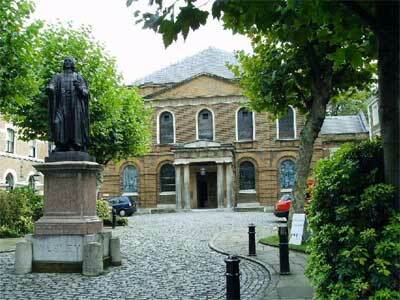 After visiting the churchyard, continue up Pitfield Street to the right of the church. If you doing the Hackney Ride, turn first right into Crondall Street. If you are returning to Russell Square, continue along Pitfield Street to another roundabout. Take the road opposite (Whitmore Road) as far as the canal bridge. 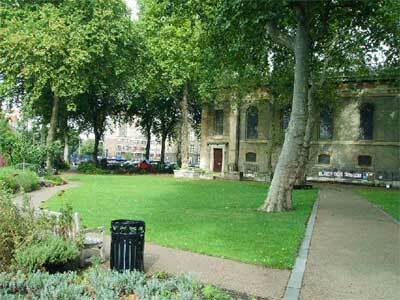 The gardens of St John the Baptist Church were originally a graveyard. Features include a garden of remembrance, with a sculpture by Mike Chapman, Biblical poetry about gardens engraved along the paths and tiles created by local school children. Cyclists transferring from the Hackney Ride join the route here. 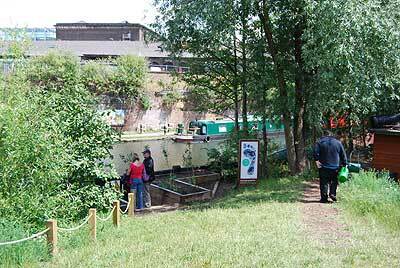 There is a ramp down towards the canal towing-path, but the start of it is hidden behind a low wall. When you emerge onto the towing-path, ride along it westwards, to the right, away from the bridge. At the top of the ramp, turn left over the bridge and right into Vincent Terrace. At the top (Colebrook Row), turn right and immediately left into Duncan Street. At the top, dismount and walk to the left along Upper Street as far as the pedestrian crossings. Cross Upper Street on foot and start riding along Liverpool Road, which branches off Upper Street at this point. Take the second left (traffic lights) into Tolpuddle Street. Stop at the zebra crossing just after the North Road pub. The public toilets are situated up the path to the left. To reach Culpeper Community Garden, cross Tolpuddle Street on foot. Culpeper Community Garden is a short distance ahead on the left along Cloudesley Road. Named after the herbalist Nicholas Culpeper, Culpeper Community Garden is a beautiful, award-winning public garden with ponds, a rose pergola, large grass area and a vast array of herbaceous perennials and shrubs. It was established in 1982 and is managed and maintained by local people from all walks of life. From Culpeper, continue northwards a short distance along Cloudesley Road and turn half left into Copenhagen Street. Cross Barnsbury Road (traffic lights), take the first left (Charlotte Terrace). Turn right into Carnegie Street and left into Muriel Street. Look for the ramp back onto the canal towing-path on the right. After about a kilometre, you will come to St Pancras Lock, shortly after passing the back of the Camley Street Natural Park on the other bank. After the lock, pass under a railway bridge and a road bridge and then carry your bike up some steps on the right. Emerging onto Camley Street, cross the road, turn right, and then ride over the canal bridge down the hill, under the railway, to the Camley Street Natural Park on the left. Camley Street Natural Park is a local nature reserve on the banks of the Regent's Canal in the heart of London's King's Cross area. Created from derelict land and opened in 1985, It was one of Britain's first nature reserves and has become internationally acclaimed. The park offers a landscape inspired by nature - a mosaic of meadow, marsh woodland and open water habitat. The garden is closed on Fridays. From the natural park, ride back under the railway as far as a gate and steps a short distance beyond on the left. Carry your bike up the steps and walk through St Pancras Gardens. Your exit is straight ahead. On leaving the bottom of St Pancras Gardens, cross St Pancras Road on foot, using the zebra crossing. Look back to admire the gates of the Gardens. Turn left into Goldington Crescent and left again into Goldington Street. Use the cycle track on the right, when you reach it. Follow the cycle track right into Polygon Street and left into Ossulton Street. Pass the British Library on the left. If you are returning to King's Cross or St Pancras station, turn left at the traffic lights at the far end of Ossulton Street. Otherwise turn right into Euston Road, using the cycle crossing, and immediately left into Mableton Place. 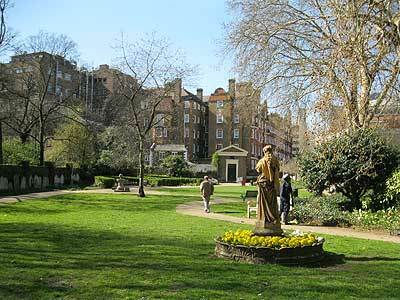 St Pancras Gardens were formerly the graveyard of the old St Pancras Church, the core of which dates back to the 11c. The gardens were opened to the public in 1891. There are many interesting features, including the extravagant Burdett-Coutts memorial sundial. 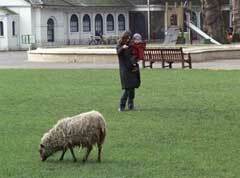 The gardens were restored in recent years by the London Borough of Camden, funded by the Heritage Lottery Fund. If you are starting from King's Cross or St Pancras stations, cross Euston Road and ride in a westerly direction along Euston Road, using the bus lane. Pass the British Library on the right and turn left into Mableton Place (traffic lights). From Mableton Place continue through Cartwright Gardens and the first part of Marchmont Street as far as the traffic lights. Cartwright Gardens were first named Burton Crescent after its builder, James Burton, and renamed after Major John Cartwright, a political reformer and resident, whose bronze statue stands in the centre of the the gardens. The crescent of houses was built in 1807-18. Turn right into Tavistock Place. If you are returning to Euston Station, use the cycle track on the right-hand side to the far side of Gordon Square, where you turn right for Euston. If you are returning to Russell Square, you may find it more difficult turning left later on if you use the cycle track. Continue through Tavistock Square and two sets of traffic lights. 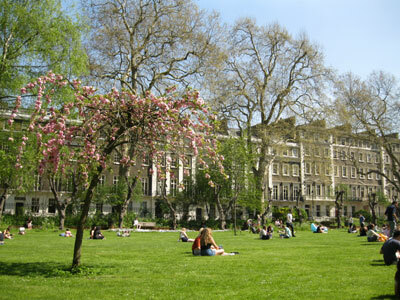 Part of the Bedford Estate development, Tavistock Square was formed in 1800 but the garden was not laid out until 1825. It now contains a number of memorials - in the centre is a bronze statue of Mahatma Gandhi. The memorial to Dame Louisa Aldrich-Blake, one of the first women surgeons, was designed by Sir Edwin Lutyens, as was the British Medical Association House, on the east side of the Square. If you are returning to Russell Square, take the first left after the second traffic lights (Bedford Way) into Woburn Square, a private road. At the back of Woburn Square, take the path through the university buildings back to Russell Square. Woburn Square is a rectangular enclosure laid out by the Duke of Bedford around1830 and overlooked by 19c terraces begun in 1829. By 1928 London University had acquired part of the site and encroachment of the garden has taken place at various times since. If you are starting from Euston Station, turn immediately right on leaving the platform and cross the station concourse towards the wheelchair exit. Pass through a small yard and turn left into Melton Street. Cross Euston Road (traffic lights) into Gordon Street. Pass the gardens of Gordon Square on the left. At the end of the gardens (Byng Place), turn left and immediately right into Woburn Square. 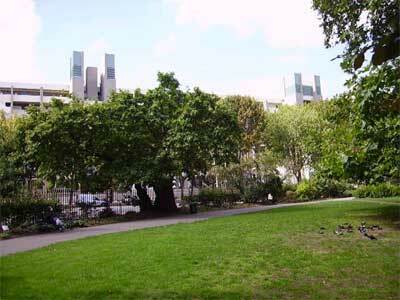 At the back of the square, take the path through the university buildings to the start point in Russell Square. Gordon Square was formed in 1800 but neither the houses built (largely by Thomas Cubitt) nor the garden made until the 1820s. 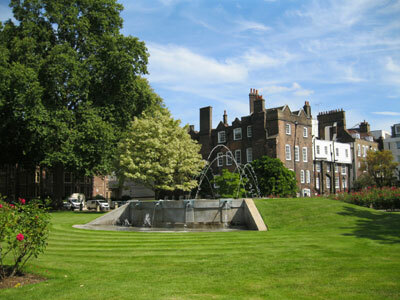 After WW2 the gardens were restored and remained private gardens for residents and key-holders. Today the gardens are open to the public on weekdays. Ride prepared by Colin Wing for the London Parks & Gardens Trust, 2006. The ride is recommended for use in daylight hours only. Please cycle safely. Ensure that your bicycle is roadworthy and that you can be seen. Follow the Highway Code and use lights in poor visibility. Use a detailed cycle map (see www.tfl.gov.uk/cycling) in conjunction with this material. The Canal & River Trust have a Greenways Code - see http://canalrivertrust.org.uk/see-and-do/cycling/share-the-space-drop-your-pace. All due care has been taken to ensure the accuracy of information in this ride, which is offered in good faith. Please advise us of any changes or inaccuracies you may encounter by writing to LPGT, Duck Island Cottage, St James's Park, London SW1A 2BJ, or email us.